Let the tasting begin! BeerAppreciators enjoying the contest. For the fourth year in a row during Philly Beer Week, The Oakmont National Pub hosted the “Oakmont Cup” – the local home brewer invitational contest. The competition and the attendance has been growing each year – and this year 76 patrons tried all 8 of the freshly brewed beers in the competition, and ranked the quality of each beer. 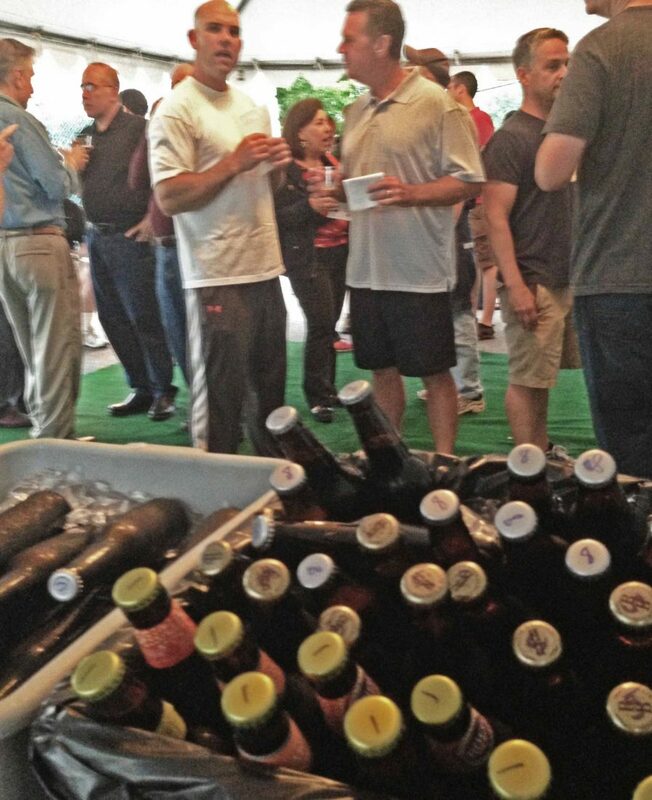 If you do the math that’s about 600 beer samples poured, served and consumed in about 90 minutes. (Erin from the Pub clearly demonstrated why she’s a top barkeep!) It’s a new record for this contest that has become a local institution during Philly Beer Week. This year’s contest pitted eight local brewers as selected by John Reynolds of Brew Your Own Beer in Havertown. Each year I select the theme – this year it was “Porter” – with John donating some of the supplies. Brendan of The Oakmont hosts the event which includes dinner for the brewers and prizes for the winners (along with bragging rights of course!). Michael Kinsley won this year, and will be engraved on the cup for best local home brew in 2013. Sean McDyer came in a close second, with perennial favorite (and 2011 winner) Krista Taylor coming in third place. “While I have been near the top each year, I have been dropping a place each of the last three years – and that’s a problem” she exclaimed. While some egos were bruised (FYI – I came in 6th when I entered in 2012), a great time was had by all regardless. Brendan had set up an outside tent just in time for the event (and in anticipation of the impending US Open) which made the whole event even more festive. With the growing attraction of the “Oakmont Cup”, the Brendan, John and I are thinking about some improvements next year to ensure that all who want to participate can and that the awarding of the prizes are more timely. 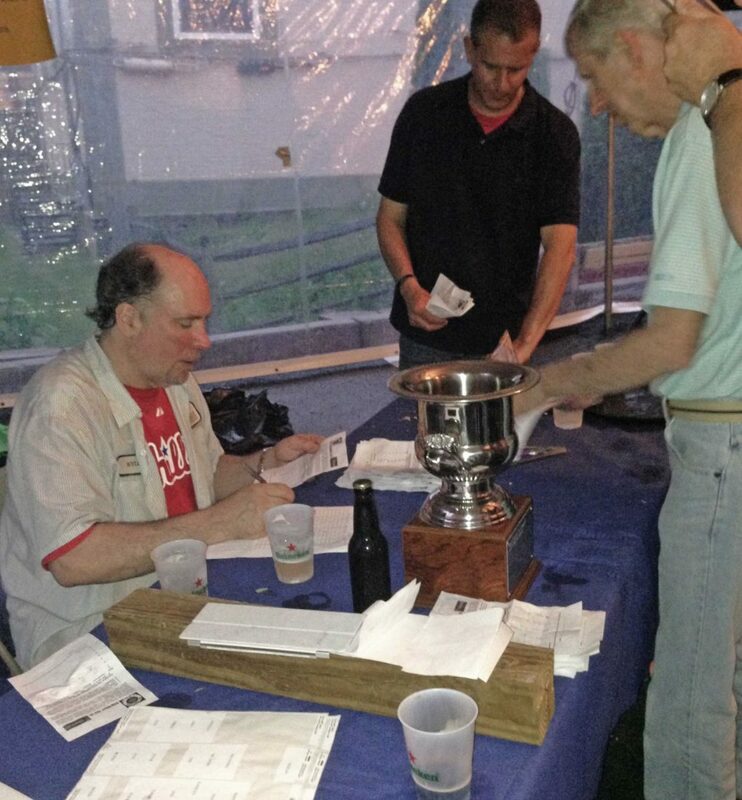 Next year we want to crack 100 voting beer judges – join us and keep promoting great fresh brewed beer in Havertown. Congratulations Michael! John helping me sort out the ballots… there were a lot of them this year.